He’s a pretty dapper not-so-scary kind of dude. We like carameled apples around here, but they taste excessively sweet to me when fully drenched in caramel. So this was a good compromise. Hair: Caramel and miniature chocolate chips. Use good caramel like the one sold here (great tips for carameled apples as well) …it makes a big difference. Now I know it’s a lot, but it stores for a year and you don’t have to peel wrappers. Bonus. 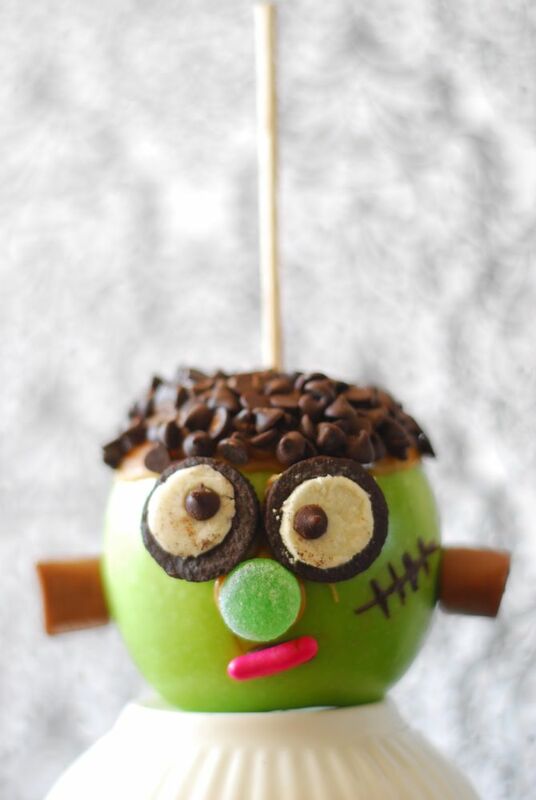 I skewered the bottom of the apple first so that I could dip the top of his head in the caramel and chips. Then you can pull it out and place it properly. Nose & Mouth: Just bought a small amount of that mix you can buy at most grocery stores that includes candy corns, jelly beans, boston baked beans, and good and plenty. Neck Hardware: Tootsie Rolls, cut in half, held in place with a toothpick. You could use caramel here too…just shape some prior to melting. I just drew on the stitches with a tiny bit of melted chocolate and a toothpick. Attached everything with a little melted caramel or chocolate.